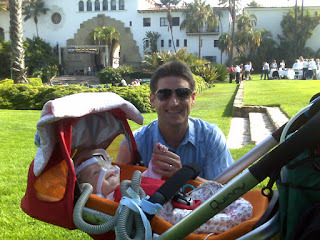 Ok, it wasn't exactly rocking, it was live, local jazz outside at the Santa Barbara Courthouse Sunken Garden, but we all had a great time together on Friday evening and THE QUINNY STROLLER HAS OFFICIALLY REDEEMED ITSELF. Victoria reached deep into her bag of tricks and cooked up a creative way to make the "flat" stroller seat in the Quinny flat enough for Gwendolyn to tolerate venturing outside. And to say she tolerated it would be a huge understatement. She absolutely loved it! And so did we. 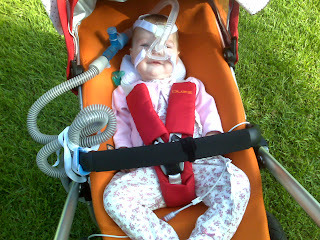 We walked down to the Courthouse from our house in the late afternoon on Friday. The weather was perfect, the stroll was perfect, the Victoria-fied Quinny stroller was perfect, all of Gwendolyn's machines were perfect, the spot we picked at the Courthouse was perfect, the grass was perfect, the shade under the tall pine tree was perfect, the wine and appetizers were perfect, the live music was perfect, the company was perfect, the laughs were perfect, the smiles were perfect (especially Gwendolyn's), the dancing around was perfect (at least Daddy tried , and the best part of all was we simply had an amazing time as a family out on a Friday evening enjoying some live music together in a beautiful setting. It was truly something special for all of us and something that we are all looking forward to doing again.